We had a fantastic time and were able to see much of the beautiful country. Jared was a very attentive guide and took great care of us. Thank goodness he drove - the traffic is awful - it took 4 hours to drive from Colombo to Kandy about 100 miles. We were able to see ancient temples, beautiful scenery, tea plantations, lovely coastlines and sit in the middle of a herd of elephants in a safari park, memories to treasure for a lifetime. Our first night was in a hotel not far from the airport and was disappointing however, our concerns were not founded for long as the rest of the accommodation was delightful. Do some planning ahead of time so you can ask the guide to take you off the standard tour if you see something you would like to visit, if you have time, Jerad was very considerate of made sure to take care of you. The itinerary is ok for someone who is limited on time and ok with spending several hrs in a car each day. But I paid so much money just to be driven around and put in terrible hotels, nothing else is included. My “tour guide” barely spoke English so I didn’t learn much about Sri Lanka. Disappointing. 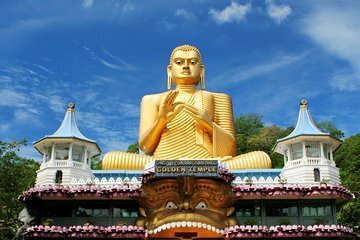 The four night, five day excursion to the Highlands, Cultural Triangle, and southern most point of Sri Lanka from Colombo was beyond wonderful. The guide was very flexible, the accommodations perfect, and the sights and sounds incredible. From hiking through tea plantations, climbing mountains to see temples, antiquities, caves and ruins, mixing with locals, a safari filled with wildlife, and adventurous meals, one could not have asked for a better way to be introduced to this amazing island nation. I highly recommend this experience. We just did a 4 night tour in Easter holiday. The operator wad very accommodating to our request and the itinerary was flexible enough. The driver/ guide was nice and friendly. Overall excellent experience.